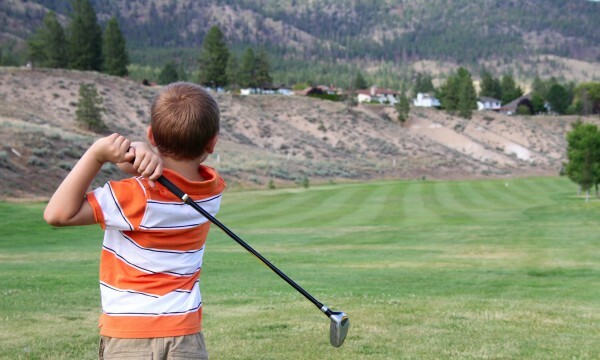 Teaching kids to golf requires diligence and patience, but these tips should help kids get on their way to learning the game of golf. 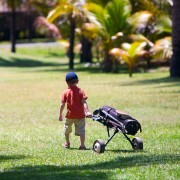 Starting with putting is a good choice for kids. 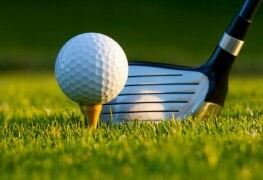 It's one of the most important aspects of a golf game, and it is also a simple stroke to learn. 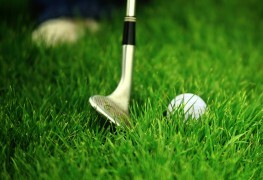 Start by having them do short putts of just a couple of feet, then increase the distance over time. Remember to use visual cues instead of technical terms when you're teaching kids. After they have gotten better at putting, move on to chipping. Start at the side of the green and show them the basic chip-shot stroke. This shouldn't be too different from the basic putting stroke. Have them try to chip the ball toward the hole, and let them know it's fine if they don't get it in the air at first. It's more important to focus on the swing and getting a nice, smooth motion. They should now be ready to move on to the full swing. Make sure to start with the grip and stance so they don't form bad habits in the beginning. The correct position is to first place the left hand around the club with the thumb pointing downward and the right hand placed just under it with the pinkie finger resting lightly between the index and middle finger of the left hand. Their feet should be shoulder-width apart with knees slightly bent. Kids might need some time to learn the full swing. Make sure to be encouraging in order to prevent frustration. Tell them it's okay if they miss the ball or only knock it a few feet. Give them tips on how far back to bring the club, ideally into a 90-degree angle with their body. Don't let them curl the club around too tightly before they bring it back to hit the ball, and encourage them to keep their eyes down on the ball instead of moving their head with their swing.